India’s natural beauty is something to see firsthand and must be protected; commit yourself to travelling with a company who believes the same. Our company adheres to strict beliefs in making the world a better place and minimizing our footprint wherever we go. Your tour leader will provide you with information about local environmental issues and provide suggestions of how we can best protect the local environment and culture. Excellent lessons to take home with you! Low Impact Transportation: This trip gives you the chance to master India’s train system from the Shatabdi Express Train, to overnighting in a sleeper car and experiencing one of the famous World Heritage toy trains on the Kalka-Shimla Railway. Local transportation allows you to experience the culture on a deeper level! Travelling in India is all about community. With its dense population and its abundance of cultural sites you can’t help but be immersed in it every day. On this trip enjoy a walking tour of Delhi guided by one of our Planeterra-supported former street kids. Perhaps try out a cooking class in Udaipur and support the local economy by visiting protected World Heritage Sites such as: Delhi’s Humayun’s Tomb, the Red Fort Complex and the Qutb Minar and its Monuments. 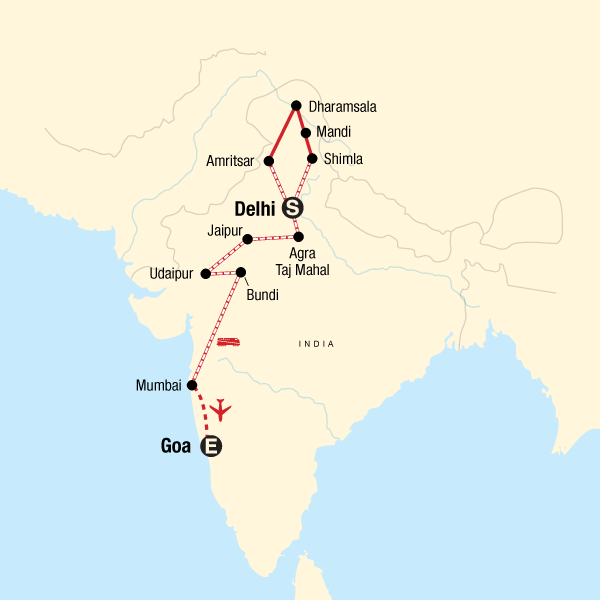 The toy train of the Kalka-Shimla Railway, The Jantar Mantar in Jaipur, Agra Fort, Taj Mahal, Mumbai’s Chhatrapati Shivaji Terminus (historic train station), Elephanta Caves and the Churches and Convents of Goa. Perhaps also, you also might consider booking your airport arrival transfer with us. All of our airport arrival transfers in Delhi support our Planeterra, Women on Wheels project, an airport transfer service driven by women who were previously marginalized, underserved, and underprivileged. It’s a fantastic way to begin your trip!